Stephanie gave me the idea to write about haunted places for Halloween. I am leaving for Kentucky State Marching Band competitions today and didn't really have anything else to write about. So here ya go. Warning this is a LOOOOOONG post. or at least long compared to what I usually post. I attended a small university in Kentucky called, University of Kentucky Morehead State. Yeah, I know we love joking about More Head. 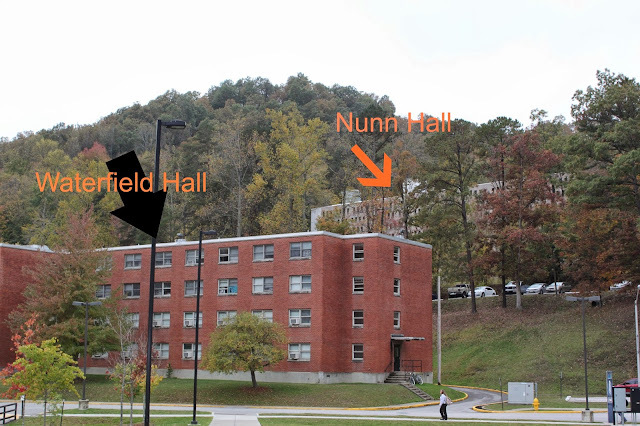 *"The University began as Morehead Normal School, which opened its doors in 1887. The private school closed in the spring of 1922 when the Kentucky General Assembly established Morehead State Normal School. The state institution accepted its first students in the fall of 1923 and graduated its first class in 1927. Name changes occurred in 1926 when "and Teachers College" was added, again in 1930 when it was shortened to Morehead State Teachers College, again in 1948 when "Teachers" was dropped and, finally, to university status in 1966." Its been said several building on campus are haunted. My office is right beside the university, so I brought my camera to work and set off on a tour. Button Auditorium: Built in 1928, renovated in 1968. This houses the drama department and the offices upstairs are ROTC. Its also where all plays and some of the bigger student recitals and events are held. Supposedly a janitor named Kate fell and broke her neck, or another story is she jumped. Seriously its not that high I can't believe anyone would try to kill themselves this way, so I believe it was an accident. Another story is that the theater department use to haze new students by "hanging" someone, only they would have a rope tied around the waist to give them support. Legend says that one time the ropes got mixed up and the person was really hung. The final story I've heard is that when the building was being built a small girl died at the site and sometimes you can hear her calling for her mom. I've been in this building a lot. Its where all the Spring and Winter concerts for my daughters school is held. Its also where the concerts for All District Band and the concerts that run every night of band clinic week. Anyway, long story short, I'm there several times a year and I've never seen anything. When I was a student I would go in wander around with my roommate at the time. I can't remember if she ever saw or heard anything here or not. Nunn Hall: *" Built in 1969 and upgraded in 2003 to improve fire safety" At the moment it is closed and under renovation. I lived in this building for two years and I will straight up tell you its haunted. The building is laid out kind of weird. Its basically like an old hotel-ish. The rooms are suites, the walkways are open with a wall about waste high. When I lived here is was the Sorority dorm. Each floor is a different sorority. The legend is that a girl was pregnant and jumped to her death. The name of the girl is usually called Penelope of Caroline, but I remember a few years ago a professor researched it and said her name was really Dorothy but she was called Dottie. I lived on the 7th floor and every night at the same time, I could hear someone walking in heels outside my door, when I would open the door to look, there would be no one there. There was also often a shadowy figure that would appear between the bedroom area and the bathroom/closet area. This was a creepy building. My coworker has lived in this town her whole life and said she remembers when the girl jumped. Nunn or at least my room had what we called a time slip. The suite is laid out 3 rooms. The first room you enter is the kitchen/livingroom that flows into the bedroom and then a very small hallway to the bathroom/closets. We started out with 4 people living there and then the OCD cleaning roommate (she was a crazy nut job) moved out, After the first year the other roommate moved out so that left me and the roommate I would keep throughout the rest of college. Sometimes you could do something in the kitchen area, walk to the bedroom and hear yourself do whatever it was you just did. I never peaked back in there to see if I could see myself because it was creepy enough as it is. Its at the end of the road, in a valley. It has hills on three of its sides, If this helps set the stage. The things that look like windows are not, the hallways are open. The story is she jumped from the 9th floor but the elevator goes up to the roof which would make for a much better place to jump from. 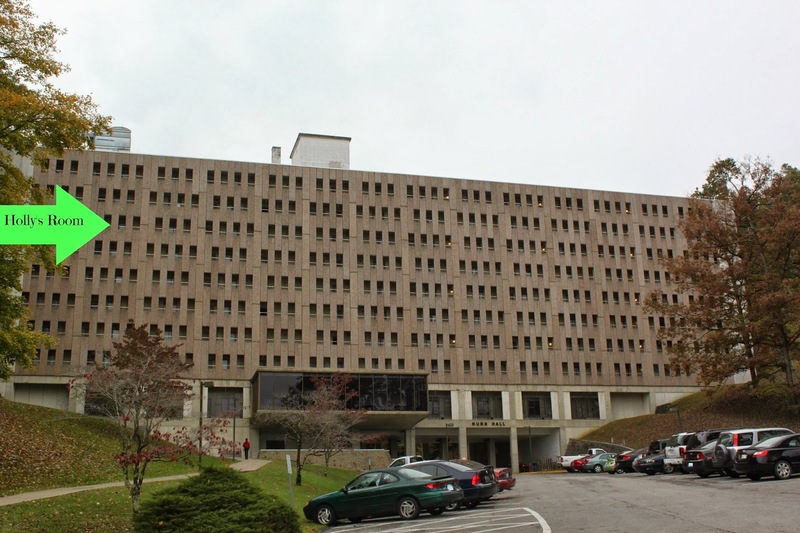 Waterfield Hall: *"Built in 1960 and upgraded in 2003 to improve fire safety, this four-story structure serves as an administrative office building and a temporary residence hall. Named in honor of Lt. Gov. Harry Lee Waterfield, the building currently is out of service." Its scheduled to be torn down but as of right now there is no scheduled tear down date. The third floor is where the excitement happens. There is a room by the bathrooms that is always empty yet you can hear laughing, talking and music coming from it. The fire doors at the end of the hall on this floor also open and slam shut late at night. To get an estimate of where everything is located in relation to each other. Baird Music Hall: *"Built in 1954 and expanded in 1967, this three-story classroom and office building was named in honor of Dr. William Jesse Baird"Greg said I HAD to add this place. The ghost supposedly is the person the building is named after. When Jesse was alive he loved Oranges and would be seen eating oranges all the time. Now he likes to leave orange peels around the building and the smell of oranges can be smelled at odd times. Jesse also gets blamed for sticking a music stand underneath the door of a practice room, leaving the door unable to be opened from the outside. I've been in this building A LOT. Not as much as Greg who as a drum major and spent MANY nights here, but I would tend to agree. The building has always been weirdly creepy. The practice room was stuck shut from the stand while Greg was there and while I was there. He said they did eventually get it open but it was after both of us graduated. 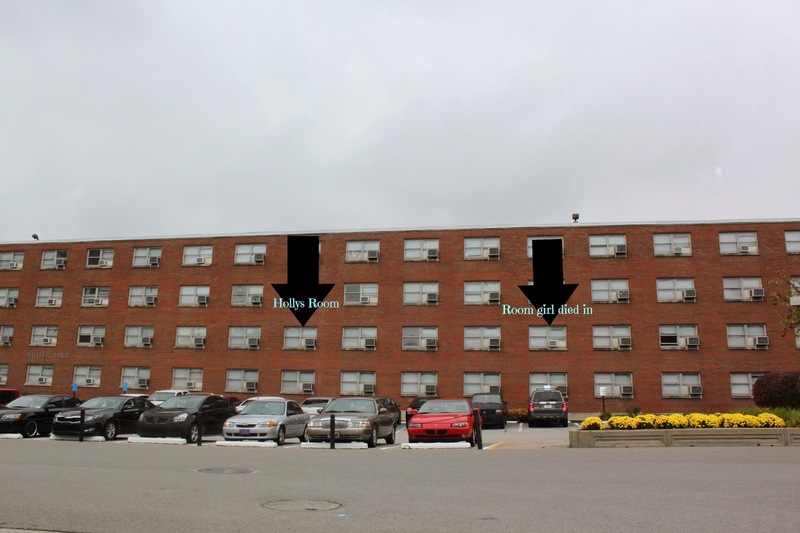 *"Built in 1961 and upgraded in 2003 to improve fire safety, this is a four-story coed residence hall" Double Occupancy Community Bath. People have said this is haunted and I don't believe it. My freshmen year, I lived in this dorm. It wasn't Coed then. Morehead is a weird little school. Its what most refer to as a Suit Case college. Most kids who can, go home on the weekends. I was no exception. One such weekend early in the semester I came back on Sunday night and got up to go to my 8:00 class on Monday. As I was returning about 9:10 there was an ambulance and a coroner parked in front of the building. It didn't take long for this sleep deprived girl to realize that the someone in my building had died. My roommate had just moved out and I was really nervous about sleeping in my dorm room alone, especially when I realized the girl that just died lived only 3 doors down from me. I will admit I slept with the lights one for about a month until I got over my fear. I never saw anything, I never heard anything. My boyfriend at the time said they had recently broken up. I don't know if he was saying that to scare me, or if it really happened. All I know is, she really did die. I'm not sure why. At the time people said a heart condition. I do know I never saw or heard anything in that building so I am going to say this isn't true. Type of Room: Double Occupancy Building Type: Co-ed alternating floors Community bath facilities. I lived in room 1313 in the dorm, I never saw anything here either, but I know that my sister will leave me comments if I don't mention it. She lived in room 707 and had a ghost she lovingly calls Pervert Pete. According to her he would make the desk chair spin and play with her hair and her roommates hair, rub their shoulders and when they were in the shower they could see him peak through the cracks in the door. She said he would move things all the time. She has seriously long hair and he once hid her tin of pony tail holders and as she was moving out she found them hidden in some weirdly random spot in the room. I'm sure she will comment and tell us all about this. to show relation of where stuff is located. SENFF NATATORIUM: *"Built in 1932 as one of Kentucky’s first indoor swimming pools, this historic structure was named in honor of Judge Earl W. Senff of Mt. Sterling, former member and secretary of the Board of Regents. It was out of service from 1988 until its demolition in 2008. "There use to be stories of this building being haunted too. The story goes that a Fraternity was hazing a new pledge and he was suppose to break into the building and jump into the pool but they didn't know was that the pool had been drained. When I was a student the building was still standing but it was chained shut. I remember hearing stories of people hearing sounds coming from there but I never heard anything. This building was near where Button Auditorium is. I love reading about, and visiting supposedly haunted places! It's funny because I can't even watch scary movies...but I'm totally on board with going to explore a place that actually may be haunted?! My husband thinks I'm nuts lol. Have a great weekend! Yay! Pete's famous now! While I lived in the room I did some investigating into who Pete may really be. Back during the 70's a student was killed in a freak accident in the parking lot. He may be Pete. When we would see Pete he was always wearing dark brown corduroy type pants, a stripe shirt and he had shaggy hair. Wow, cool. I love haunted places. So cool! Pervert Pete sounds hilarious. Your dorm sounds suuuuper creepy though with that time lapse thing. I'd be so creeped out! As far as ghosts go Pete was cool. I kinda miss his antics. 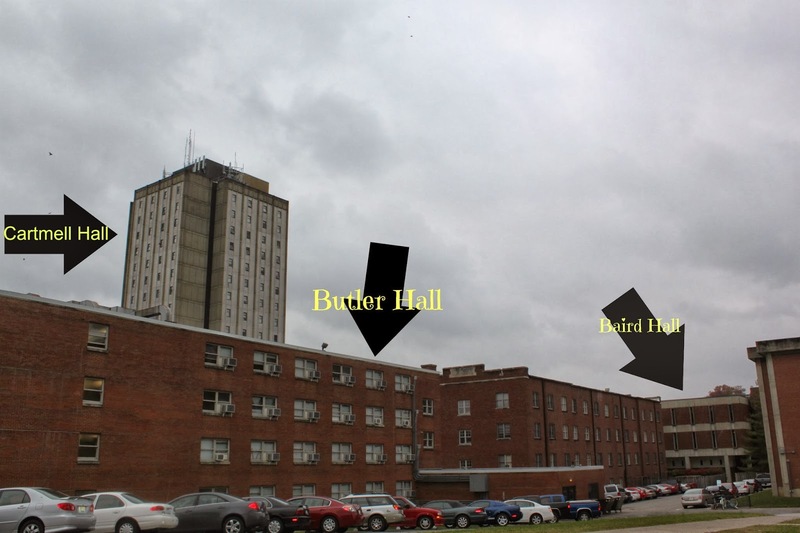 I was attending the University the time the girl at Butler Hall commited suicide. Yes it was over a guy. Yes it was due to Asphyxiation. It was over a long break in the fall. 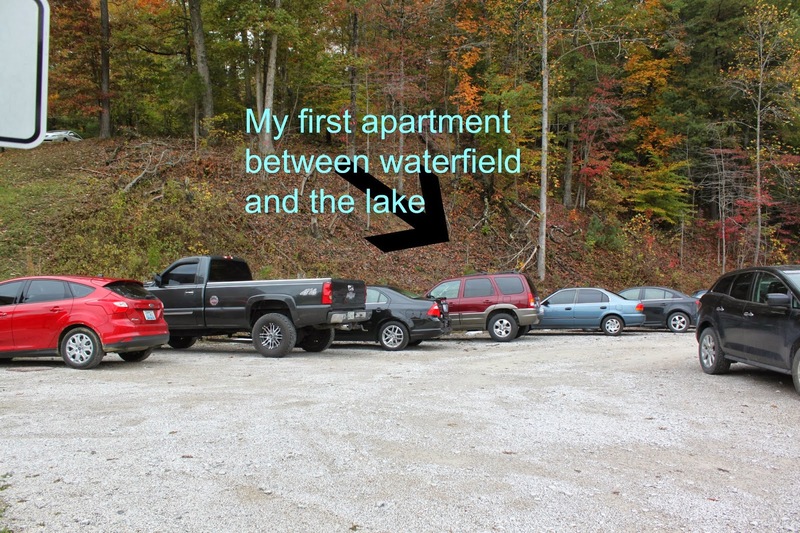 Because of the nature of the incident the university quickly took care of it. Most students do not know of this incident. Still it did happen I witnessed the coroner arrive. I was in class when the coroner arrived, but got there as they were wheeling her out. It's cool we were there at the same time.